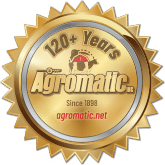 Agromatic Inc. has been providing America's Dairymen with the industry's highest quality agricultural equipment since 1898. As a family operated business we will continue to grow and meet the needs of our customers with unmatched service. We are dedicated to expanding our distribution network to better serve our customers. We will strive to be in the forefront of technological advances and introduce that technology to the market only when it meets our rigid reliability and quality standards. Copyright © 2013-2019 Agromatic Inc.